What Is a Bear Market and What Does it Mean in 2018? The foil to a bull market, a bear market happens when stock prices drop 20% from a previous high in one or more index for at least two months. Analysts and market bulls alike have been riding the wave of the so-called longest bull market in history, with the stock market at all-time highs. But, what happens when investor confidence starts to wane and prices begin to slide? Enter the bear market. Market fluctuations will have a big impact on your portfolio, so it's important to know how a bear market might affect it. And with sometimes disastrous results, the bear market is something to watch out for. But, what exactly is a bear market and what are the warning signs? Perhaps more importantly -- are we headed toward one right now? A bear market is described as a period when market prices drop 20% from a previous high (after a bull market, for example), typically over at least two months (60 days), in one or multiple major indices, like the Dow Jones Industrial Average (DOW or the S&P 500 . Contrary to its counterpart bull market, a bear market signals a loss of investor confidence, an increase in pessimism in the economy or markets -- and is often accompanied by things like rising inflation, high unemployment, or a coming recession. And while bear markets typically don't last long (most bear markets in the past have only lasted around 10-15 months), they can mean big losses. Bear markets are not the same as market corrections -- when the market drops 10% from a previous high -- but they can be started by a market crash (which happens when prices drop 10% in one or two days). 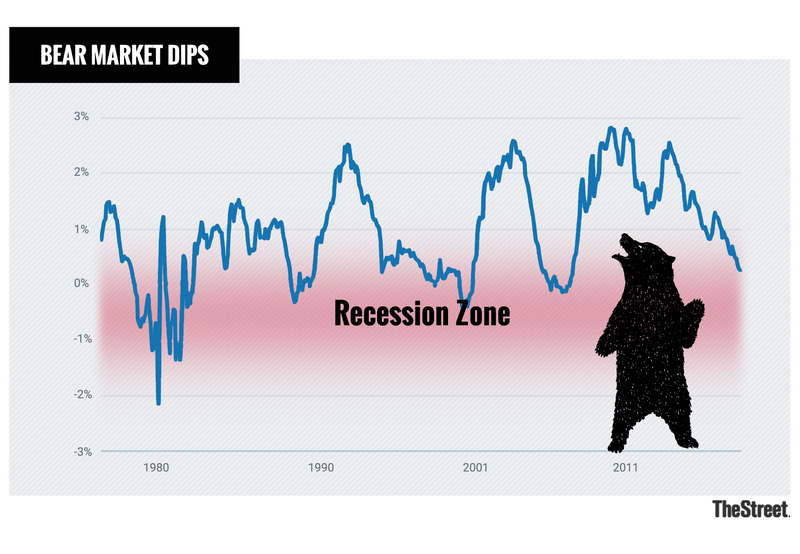 Although the Great Recession is still burned in our minds, bear markets are often more blips in the market than prolonged catastrophes -- and typically happen an average of once every 3.4 years, according to MarketWatch. As is logical, the bear market occurs in the contraction phase of the business cycle -- so, bear markets are unlikely (and, in fact, a bull market is likely) when the business cycle is in the expansion phase. While there are many aspects of a bear market, some of the major touchstones of a bear market include recession, commodity spikes, overvaluations, low employment, rising inflation, Federal Reserve tightening, stagnation, irrational investor confidence, or asset bubbles. According to Business Insider, in the past, recessions have been tied to bear markets eight times, while commodity spikes have been associated with them four times, extreme evaluations five times and Fed tightening four times as well. Often, when the average P/E ratio (price of a stock compared to its earnings) is overvalued (according to Forbes, being over 25), a bear market could be on its way or already happening. This overvaluation could cause stock prices to suddenly start dropping, and create investor pessimism -- and therefore, selloffs. Additionally, a lagging GDP as well as economic realities not coinciding with stock prices could affect the market and lead it into bear territory. On average, a bear market only lasts about 10-15 months, with stocks dropping around 32%, according to CNBC. Most analysts agree the most recent bear market was from October 2007 to March 2009, when the DOW lost 54%. Just like a secular bull market, a secular bear market is one that lasts between five and 25 years. And while the average length of a secular bear market is about 17 years, there may be smaller bull or bear markets within it. Still, the average bear market is much shorter -- usually under a year -- and so definitions of what constitutes a secular bear market vary. In fact, several analysts claim we are actually in a long-term secular bear market -- and have been for a while. What is a Bear Market Rally? A bear market rally is a trend that tends to trick investors into thinking the bull market is on the rise again -- but is, in fact, an upward trend where the stock market posts gains for a couple days or weeks but drops again. There may be several bear market rallies within a regular bear market, but an upward trend can't be considered a bull market until market prices rise 20% or more. And while a bear market rally may temporarily increase investor confidence, it doesn't necessarily last very long. What are the Origins of the Bear Market? The term "bear market" refers to a prolonged drop in the market -- and is characterized by how a bear swipes down to attack its prey, thus signaling a "swipe down" in the market. However, the origins of the reference go back several hundred years. In the 1500s, bull and bear baiting was a betting sport where dogs would attack a chained bull or bear and bets would be placed on the outcome. Although the sport is now illegal in all but one state (South Carolina), it was the first dual association of the bull and bear. In the 17th century, hunting terms began to further the association with the market, and in the 18th and 19th centuries, the terms were first used in reference to the stock market. By 1873, a painting featuring bulls and bears depicting a stock market crash by William Holbrook Beard solidified the association. While a bear market is one where market prices decline by 20% from a previous high, bull markets, on the contrary, are defined by prices rising 20% from a previous low. Bull markets typically are aided on by things like high investor confidence (or even exuberant stock evaluations), rising employment rates and other positive indicators. Additionally, bull markets are typically longer than bear markets -- and, in fact, many analysts estimate the current market is the longest bull market in history -- at over 3,400 days. Still, bear market rallies may seem as if they are a rising bull market, but until the market shows gains of 20% from the bear market low, it can't be considered a bull market. And, while bear markets occur during the contraction phase of the business cycle, bull markets typically happen when the business cycle is expanding (shown by several indicators, like lower inflation and increased employment, among others). Are We Headed for a Bear Market in 2019? There has been a lot of speculation about when the next bear market will hit -- and no one really seems to be sure. Some analysts have claimed that we are currently in a prolonged secular bear, while others claim the bear market is still years away. "I think we're in a rolling bear market," Mike Wilson, Morgan Stanley's (MS chief U.S. equity strategist told CNBC in May this year. "It's fooling everybody at the index level, but there's a lot of pain out there." However, rising interest rates and other factors have begun to concern strategists. "We believe we are in a 'rolling bear market,' a market where risk assets across sectors and geographies reprice to account for the removal of central bank provided liquidity," Morgan Stanley strategist Mike Wilson told TheStreet in September. "Less central bank liquidity support as we near the end of an economic cycle should bring higher volatility, as risk assets and markets lose some of their ability to absorb shocks. Our call is not for a simultaneous and large repricing across risk assets, but for a bear market that rolls through different assets and sectors at different times with the weakest links (Bitcoin, EM debt and equities, BTPs, funding spreads, base metals and early cycle industries like home builders and airlines) being hit first/hardest." And, rising concerns over the escalating trade war have caused stocks to drop recently -- possibly signalling a turn in the fortunes of the market itself. In fact, the Dow declined 77 points, or 0.29%, to 26,077, the S&P 500 fell 0.45% and the Nasdaq slumped 1.1%, TheStreet reported. Still, not all are so convinced the bear is swiping down upon us just yet. In a report earlier this year by the Wall Street Journal, market indicators suggest the bull market still has a ways to go before it turns. And, others speculate the bull has longer to charge. But the question everyone seems unsure of is -- for how long? While a variety of factors could contribute to a bear market (including political or other external factors), the yield curve, recession and overvaluations are typically the main culprits to watch out for. One of the major indicators that a bear market may be on the way is the yield curve. While the yield curve is currently flattening out, and not inverting, by sitting at around 0.2%, it is right on the edge. When the yield curve is flat, that means that the 2-year spread and the 10-year spread for bonds (in the case of the U.S. Treasury yield curve) are around the same -- basically, that the long-term interest rates aren't much better than the short-term interest rates (which they ideally should be). Given that interest should be higher for lending the government money over a long time (giving up the opportunity to do other things with your money like invest in stocks), an inverted yield curve is a sign of danger and a possible bear market. Additionally, signs of recession -- like increasing unemployment, slower GDP growth and rising inflation -- can all contribute to a bear market (or may be signs that the economy is already in one). How Can You Prepare for a Bear Market? While there may not be much you can do to avoid losses during a bear market, diversifying your portfolio (and thus reducing risk) can help dull the effects of the bear market on your personal stocks or bonds. "The first thing to do is check the current risk of the portfolio," Alexander G. Koury of Values Quest Inc. told TheStreet in July. "This will help the investor determine what would be the worst-case scenario if the market were to move into a bear market. That means an investor will know how much they're willing to lose of their portfolio, and they can determine whether or not that is comfortable for them." Additionally, things like setting aside emergency funds or short-selling stock (if you've got an eye for it) could help you minimize losses and be more stable in the event that you do suffer substantial losses.